Don't you just love autumn? I sure do- it's my favorite season! I'm so glad to be rid of the oppressive heat of summer (and the mosquitoes and chiggers!) and I love the way the light shifts, lending the sky a beautiful clarity. Right now I'm seeing an explosion of pumpkin recipes across the internet, but let's take a moment to focus on another seasonal produce treat: apples. Growing up in Michigan, one of the top apple producing states, I always think "apples" when I think "autumn". 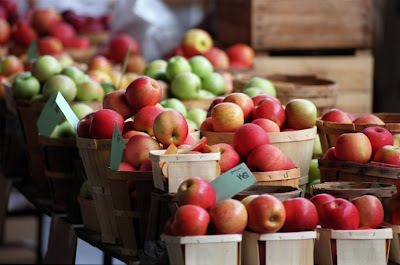 Apple cider, apple spice donuts and the smell of fresh apples at roadside farm stands. I don't really get to indulge my apple obsession here in the South and many of the varieties I love like Northern Spy, Winesap, Cortland and even decent MacIntoshes are harder to find or unavailable down here, so when I noticed a "free apples" sign on a neighbor's apple tree, I was so excited! Of course I picked a bunch and I knew I had to come up with some kind of apple cake recipe. This is really just a variation on my original vanilla cake recipe, but the flavor is very different and even the crumb texture seems a bit different (maybe because of the spices?) It makes a lovely breakfast treat or, with the addition of some fresh whipped cream, a homey dessert. It would also be fantastic with pears or even a combo of apples and pears. I can see making this at Thanksgiving. Stevia (I like NuNaturals NoCarbs Blend) to further sweeten- judge by tasting the batter. I always make sure the batter is slightly sweeter than I want the final product to be. Some of the sweetness bakes out. 1. Sauté sliced apples (preferably in butter) until softened and set aside. This step isn't vital, but sautéing the apples gives them a nice flavor and texture, so I don't recommend skipping it. 2. In a large bowl, whisk together eggs, coconut milk and vanilla extract. 3. In another bowl, combine almond flour, coconut flour, sugar, salt, spices and baking soda. 4. Mix dry ingredients into wet with a whisk or mixer and mix well. Add stevia to taste. Pour batter into well greased 9 inch round pan or 8x8 square pan and arrange the apple slices on top and slightly press them into the batter to make sure the edges are flush with the batter. This prevents the apple slices from curling. Sprinkle with cinnamon. Bake for 28-30 minutes and enjoy the heavenly scent that fills your kitchen. Will have to give this a try! It sounds delicious :). Just yesterday started my first batch of hard cider (not great according to Mark, I know :P ). I do so love autumn! This sounds great. I just started a GF diet. I might try it with the pears and apples.